Marines in all armies tend to be an elite body, sent to perform particularly difficult assignments in all manner of circumstances. Of course originally they were soldiers on board ships, and consequently they specialise in amphibious assaults. During the war in the Pacific such expertise was continually required, and most US marines were deployed there between 1942 and 1945. 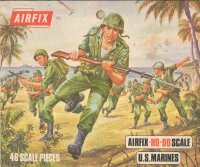 This set from Airfix marked their second attempt to portray this subject - their first, or type 1 set, is reviewed here. For the new set Airfix reduced the number of poses but provided much greater quality. Better yet all the poses are appropriate to their subject and have been skilfully realised. Several give the appearance of advancing under fire, and are therefore ideal for assaulting beaches. One of the best is the man lying down and about to throw a grenade. This is a most novel figure and it works really well. However not all the news is good, because one very stupid mistake was made when this set was designed. The small boat has been provided with two men paddling it, but these are two copies of the same pose. Since the men must be either side of the craft they must also be paddling in opposite directions, ensuring the boat merely rotates and goes nowhere. The only solution is to take the paddlers from the first type set! The uniform is something of an oddity and not entirely suitable for the Marines. The men seem to wear a shirt/jacket with four pockets, and trousers with large cargo pockets on both legs. The usual Marine uniform in combat, the fatigues, had fewer shirt pockets and no cargo pockets for most of the war, so it would seem that these figures include elements of Army uniform, which betrays their origins as 1/32 scale US Infantry. Some men have their shirt tucked in their trousers while others have it loose. All wear the M1 helmet, and all wear the long leggings which were rarely worn by the Marines. None have much in the way of webbing or equipment, which implies they are not in the first wave of a new assault but have arrived later, once kit can safely be left at a base before going into combat. However many are also missing basic items such as knives, and have an incorrect arrangement of the entrenching tool. Weaponry is an authentic mix of rifles, carbines and 'Grease' guns. A man with a bazooka has been included, but there is no-one to load the weapon. The 'boat' is presumably meant to be a model of the LCR(S), which stands for 'Landing Craft, Rubber (Small)'. If so then it is a nice thought, but not particularly accurate. The real craft was pointed at the bow and straight at the stern, much like any other boat, and had cross pieces. The standard of sculpting is extremely good, with plenty of life in each stance. There is sometimes no flash to speak of, although this varies greatly depending on the year when the figures were produced, and the detail is clear and plentiful. There is a suspicion that two sculptors were involved in this set, as the figures which were used for the 1/32 scale set are a little larger and more solid than the rest. However the difference is easily explained by the different stature of men, so this is not a detraction. With such an energetic collection of figures this is a well designed set that deserves a place in any World War II US army, but the 'Marines' label is much harder to justify.